Open to public to climb - Yes. Open Tues. through Sat., mid-May to mid-September, 9:30 am to 4:00 pm. Tickets- $8 adults / $4 for children and seniors. Keeper's House - Open to public - first floor visitor center. How to get there - By private boat, public dock available but no tie-up permitted - only unloading. Anchor along beach. Also by private passenger ferry runs from Harker's Island or Beaufort - see list of NPS approved ferry services. 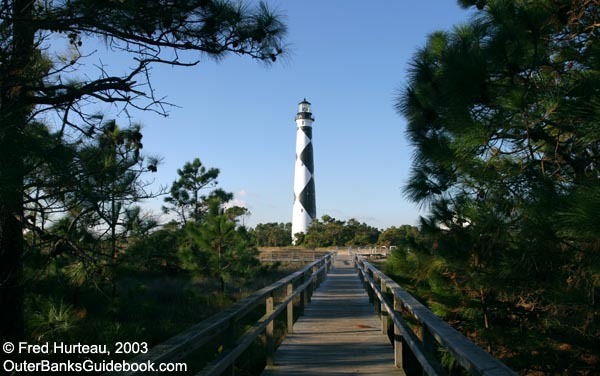 For many long years Cape Lookout Lighthouse was not open to the public, except on rare special occasions. All these photos were taken years before it was renovated and finally opened to the public on a regular schedule on July 15, 2010. 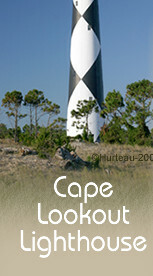 You will view Cape Lookout as few people had ever seen it prior to that time. 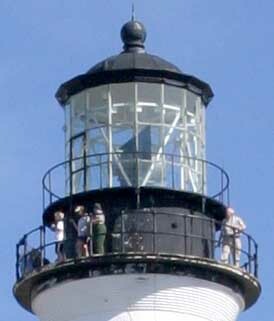 With the lighthouse finally renovated and safe for the public to climb it, more people will have the chance to take the tour as presented here. In 2004, this tour was a very special treat indeed. 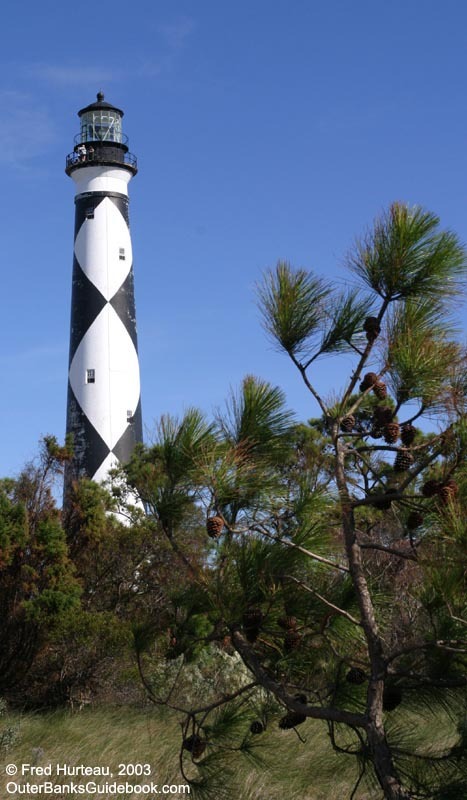 Now though, everyone can have the opportunity to see the magnificent vista afforded from the gallery of Cape Lookout Lighthouse. 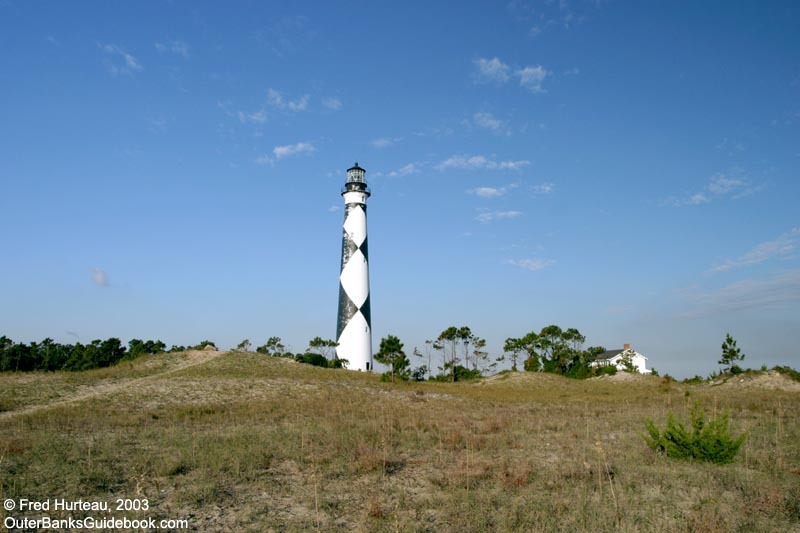 It is a panorama unmatched by any of North Carolina's other lighthouses. 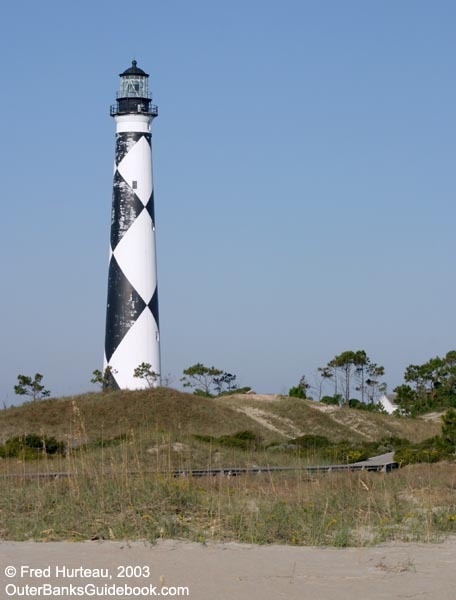 Cape Lookout Lighthouse might be called the least accessible of those on the Outer Banks because it is only accessible by boat. However, the trip is well worth the effort. The view from the lighthouse alone is worth the expense and time invested. 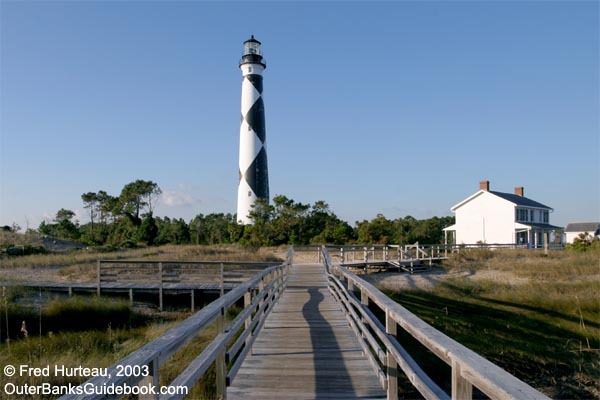 This tour best begins with a familiarization of the layout at the Cape Lookout Light Station site. In September, 2003, just after Hurricane Isabel, NOAA took aerial photos of the entire Outer Banks, including all the lighthouses. 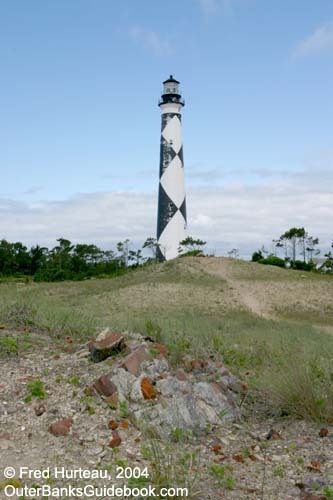 In this NOAA photo of Cape Lookout, north is at the top, corresponding to the way we normally think of the compass. 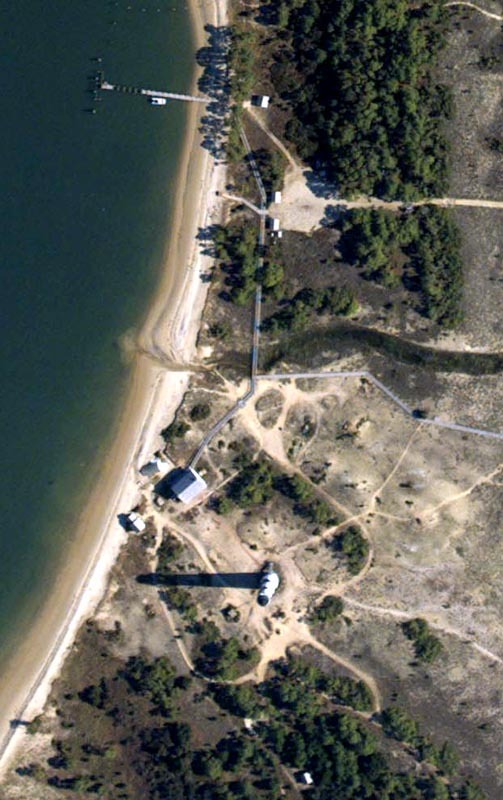 There is boardwalk access that runs from the pier on the sound (upper left of photo) all the way to the Keeper's Quarters (near left center), and branches off to run east most of the way to the ocean beachfront. It is reasonably easy to walk down the beach from the pier to the lighthouse as well. The boardwalk spans the small creek, but taking the beach route crosses any creek outflow that might be present. The lighthouse shadow is prominent in the lower center of the photo. In the upper center, just south and east of the pier, is a large sandy patch and a road leading east. This is the staging area for 4WD tours by NPS-approved guide services. The satellite photo at left, also from NOAA, shows a wider view to orient yourself to the area. Compare this with the Coastal Guide Map to get your bearings. 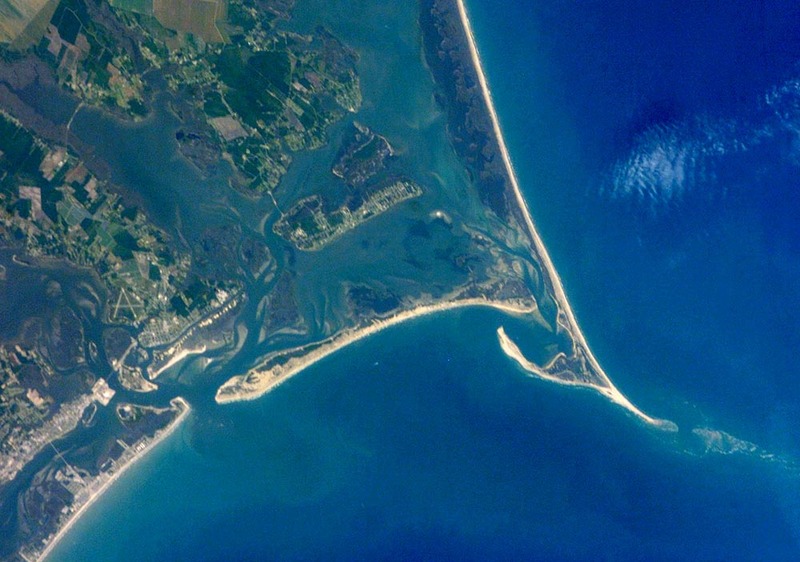 This satellite image provides a great view of Cape Lookout, South Core Banks, Shackleford Banks, Harker's Island, Beaufort Inlet, Beaufort, Morehead City, Atlantic Beach and much of Bogue Banks. It also shows how far the shallows extend out beyond the cape point into the ocean. 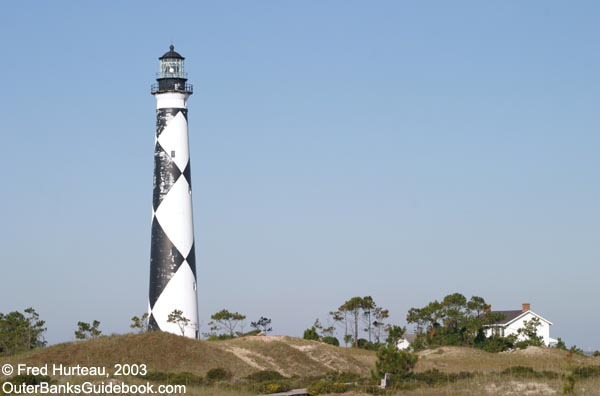 Two initial trips were made to Cape Lookout Lighthouse for photos and information for these pages: one in late October, 2003, and one in early November, 2003. Both "expeditions" were staged from Harker's Island for three reasons. 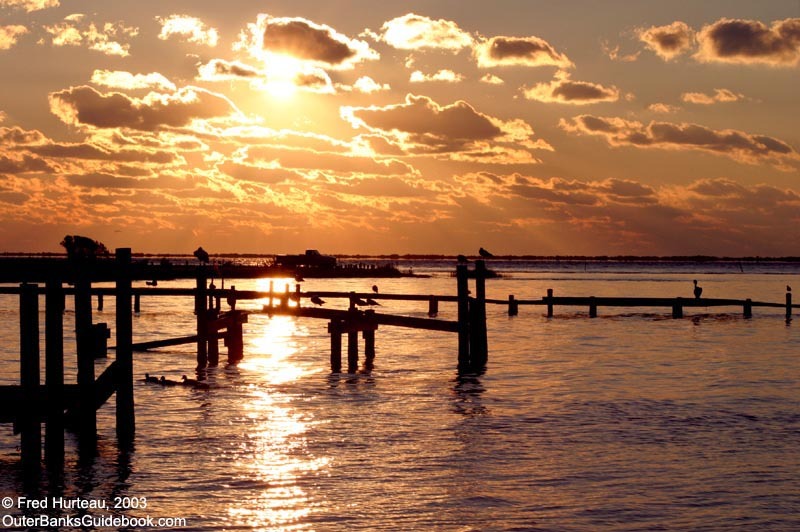 Harker's Island is the shortest private ferry ride to Cape Lookout; the sunrise, sunset and bird photo opportunities were better than Beaufort (the other possible choice); and it was right on the way to Cedar Island for the ferry ride to the next stop on both trips - Ocracoke. Both boat and lighthouse glow in the golden light of a spectacular sunrise (far left), in this telephoto image taken from Harker's Island. The lighthouse seems to rise from a mirage in the chilly air of an October morning. 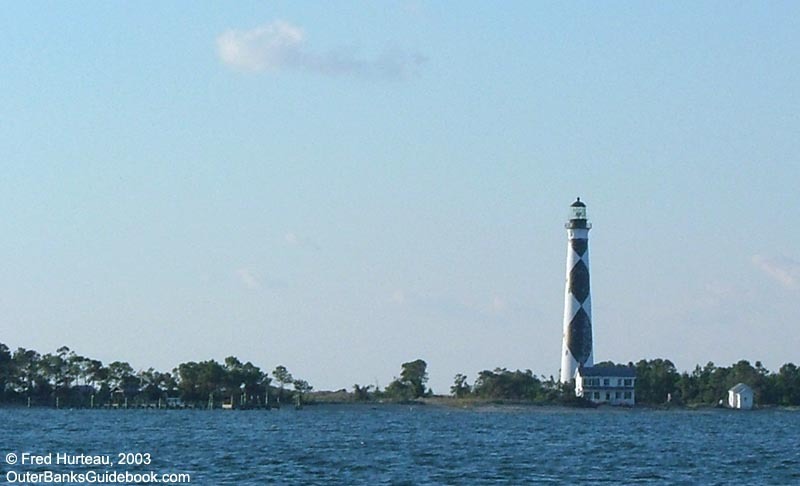 Getting to the lighthouse is as easy as riding one of the private passenger ferry services from Beaufort (see list of NPS approved ferry services). 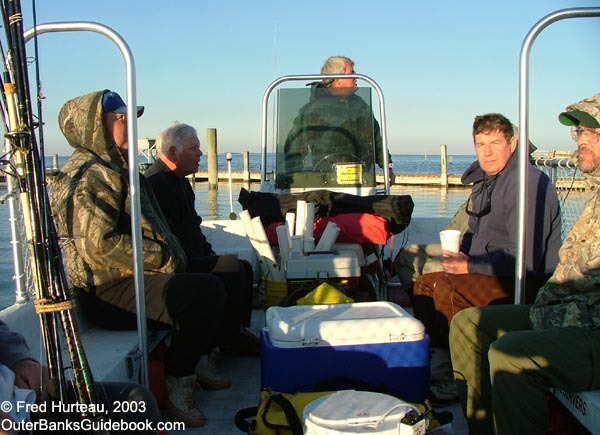 This photo shows several fishermen taking the ferry for a day of surf fishing at the cape. The ferry must round the east end of Shackleford Banks to reach the lighthouse. 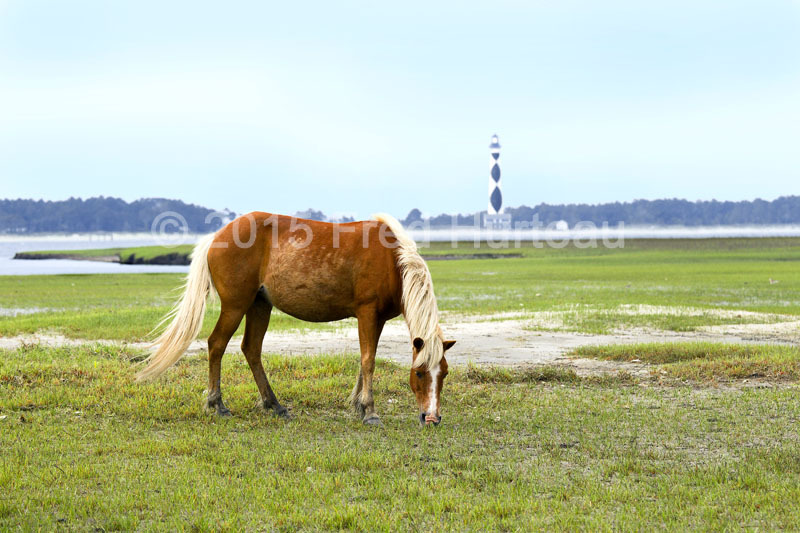 If you're lucky, you might spot wild horses on Shackleford as we did. These ferry services will also take people to Shackleford Banks and pick them up on a schedule. 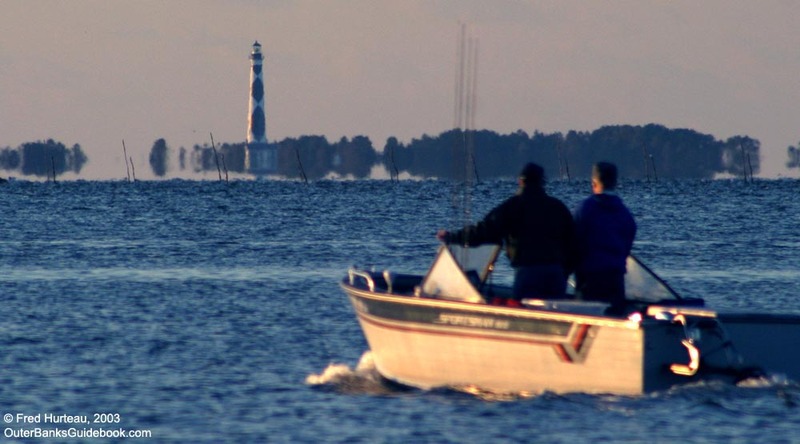 The lighthouse is visible from Harker's Island. It's virtually impossible to take a photo while bouncing across the water. But once you get closer and the ferry slows down, you can likely get a nice photo from offshore. 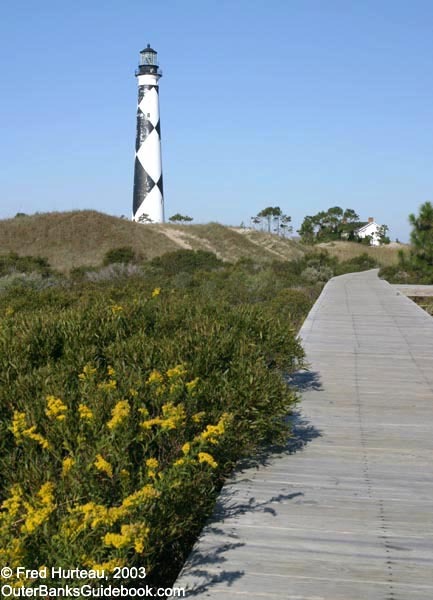 When you reach shore, your first views of the light station will be looking up the beach, or walking along the boardwalk. 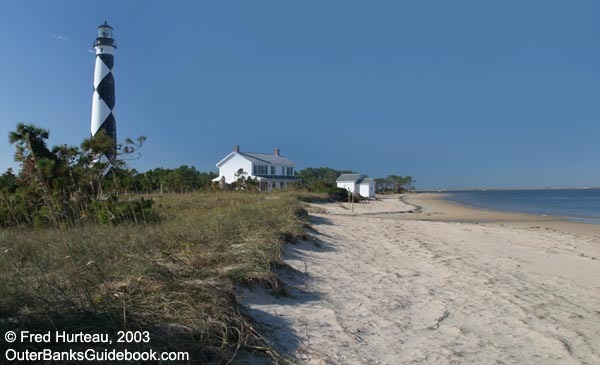 Hurricane Isabel caused more erosion in front of the Keeper's Quarters and toppled the coal shed in front of the house. It also broke apart the concrete foundation for the coal shed, so the collapsed structure had to be removed for safety, and for aesthetic reasons as well. The Keeper's Quarters has a tiny gift shop and a one-room "museum" of artifacts from the light station. 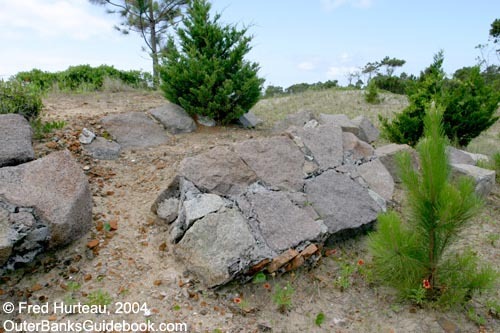 Walking back along the boardwalk and east toward the ocean you will pass several mounds with stone rubble. These mounds (left photo) are said to mark an earlier Keeper's Quarters, the first (1812) tower location, and other former structures. The photo at right is a different angle taken from the "road", and shows the boardwalk. 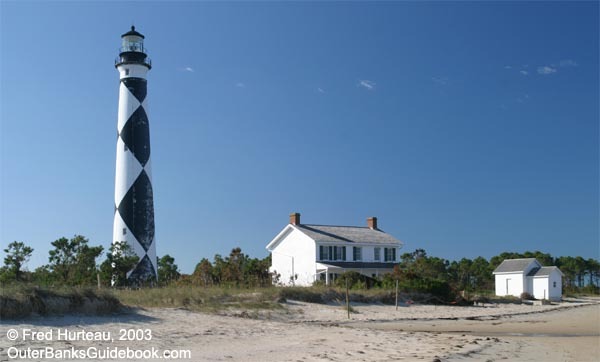 The left photo, taken from the boardwalk, gives yet another view of the lighthouse, Keeper's Quarters and the mounds. The boardwalk takes you out to the ocean beach, shown in the photo at right taken from the lighthouse gallery. 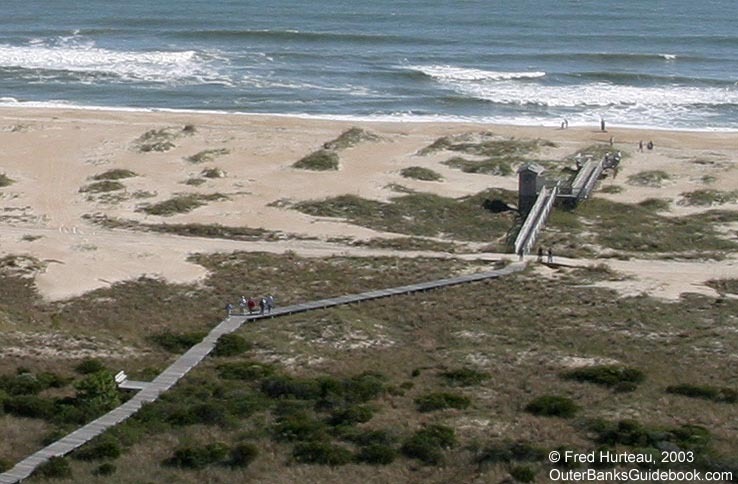 The dunes are badly damaged, having been torn down and washed inland by Hurricane Isabel only six weeks before. The day this photo was taken was the first time since the storm that the "roads" on Cape Lookout were reopened to the 4WD tour vehicles. The foreground in the left photo shows more detail of the rubble on one of the mounds. The photo at right shows some of the largest sections of stone, still mortared together. This would appear to be part of the base for an earlier lighthouse. By now you have surely noticed that the lighthouse is in dire need of repainting. The paint problem was there long before Hurricane Isabel came to visit. There was a problem with the paint being the wrong kind or improperly applied the last time it was painted, and it has been deteriorating for quite some time. Navigate to individual lighthouse pages with these buttons.